Exercise. Fitness. Working out. Training. Aerobics. One thing unites all these words, despite the various emotions and images they may evoke, they all describe physical movement. They all make us SWEAT. Maybe you are sweating because of the intensity of the training, perhaps you are sweating from the anxiety of going to the gym for the first time in a long time. Perhaps you are sweating over the money you spent on group classes, a family gym membership or hiring a trainer. Whatever the reason, SWEAT elevates physical movement to a new dimension. It is about more than showing up, punching a clock, going through the motions. To SWEAT requires dedicated, consistent investment to the process. It is the shift in mindset, and longterm vision that makes working out escalate into SWEAT equity. I remember growing up an athlete. From the time I was 5 years old, I had on a uniform. Whether it was T-Ball, Soccer, Basketball, Volleyball…season to season the colors and the gear in my bag changed, but the passion and focus on personal improvement never wavered. I was simply born to SWEAT. 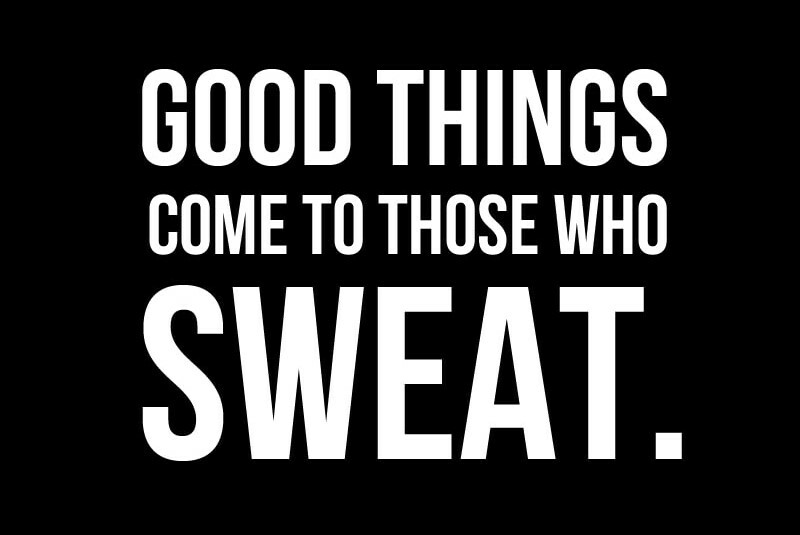 Even today, when I hit the gym at 5am while many folks are still cozy in bed, I am striving for one thing…a good SWEAT. It is about cleansing my life of the stress from the day before and creating space for the day to come. For me, it is a barometer of my work ethic, a gauge of how hard I am pushing, and how much more I have in the tank. I can hear you saying it now, “I just don’t sweat”…sure, there are some genetic differences in how much people perspire, but you know where I am going with this. You have to KNOW your own thresholds. You must be intrinsically motivated to reach, if not surpass, those thresholds every time you train. The goal is that you start to intrinsically identify those self-imposed limits. You might not be ready to do it alone. Most days anymore, I can hit the gym and push myself to my limits. However, there are still times when I need a coach, or teammates to help cultivate in me that added level of intensity. Maybe I had a rough night’s sleep, or I did not FUEL my body like I should have the day before. Maybe life’s stressors are weighing me down. It is okay to seek some sweat buddies when you need them. There is something contagious about energy and drive when you are surrounded by a group of dedicated others striving for the same result…personal performance. But I also want you to learn how to identify and push your own limits. Only then can you truly know your capacity. When you can dig from within, when you can start to know your own body, and what it is capable of accomplishing. This is the difference between working-out and SWEAT. The inner strength. Sweating from the deepest places of your spirit and proving to yourself that no matter how hard you think you are working, there is always one more gear.